A cat shampoo for dandruff and shedding can make a big difference in how your cat feels, and how your home looks. These products are intended to prevent dry skin and help eliminate shedding. Both of these conditions can be caused by poor nutrition, or by skin that is dry and damaged. Some cat grooming supplies may contain ingredients which can cause your pet’s skin to be dry and flaky, especially if your cat suffers from skin allergies or other conditions. The right cat shampoo will soothe and hydrate the skin instead, and prevent any dandruff and excessive shedding while keeping the skin and fur of your cat healthy and comfortable. One cat bath product for dandruff and shedding is the Furminator deshedding shampoo. There are also many others available commercially, and another option is to make your own using one of the many recipes online. A cat shampoo recipe that is rich in oils and other hydrating ingredients can help skin stay soft and supple, and prevent hair loss that is excessive. Using a cat flea shampoo which will kill fleas and ticks may cause dandruff to get worse, because these shampoos may contain harsh chemicals or toxins which can dry out or irritate the skin of your pet. Once you find a cat shampoo that actually improves your pets skin and coat it is important to continue using it. 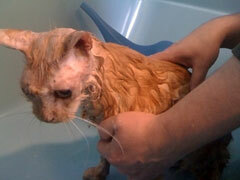 Shampoo is not the only treatment that will help though, there are other cat grooming tips that can benefit your pet. A diet of canned food has been shown to stop dandruff, and certain supplements can also promote skin and hair health. It may take some trial and error before you find a shampoo and other treatment methods that work, but do not get discouraged. With all the products available there is one that is perfect for every cat.